I showed that to Ava and she said I should make THIS the profile pic, so I did. Ava Rage makes me the Queen of Shopping, and inspires my new profile shot. While I haven't been blogging about SL, I have been doing my usual bit of shopping, socializing, talking about shopping while socializing, thinking about shopping, and perhaps doing some shopping. 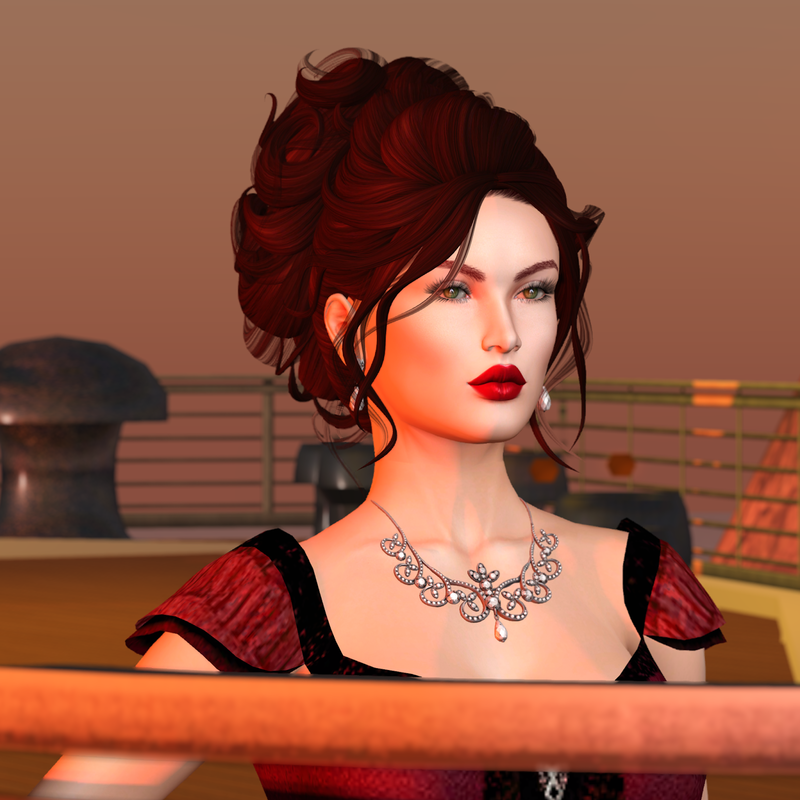 One of the ways I do that in SL is groups, the Fashion Emergency, and the Maitreya Lara group in particular. In these groups I talk with other fashionistas like LaDonna Upshaw, Vivienne Graves, and the maker of posestands, and other photoprops, Ava Rage. These people have been among my fashion enablers over the past years. Now recently we were talking skins and Ava mentioned she uses the Lumae Eirtae. I told her that while I had the Eirtae it wasn't quite me and I mentioned it was the Melusine that I'd picked up at some fantasy event...and then she said something like "CC, that's a special edition version, theres a regular version!." Then I have my Don Draper moment and say "What?" Then, relatively quickly, meaning the next day, I go visit Lumae. Now my readers and flickr followers have seen Lumae's fantasy skins here before, the Dark Elf-ish Hecate, the Devilish Naamah and the Wicked Green Orismer. I liked them quite a bit and liked them after I picked up my Catwa Tumble head. Now the important thing about skins and appliers for me is "Does it come in a pale enough shade? Does it suit a redhead? Is it fairly priced and of goodly quality?" Yes, yes they do. I eventually picked up the Eirtae and Ruby sets in T3/Shell and T4/Fawnshades. The T4's because I discovered the T3's weren't quite perfect for some modern looks. When I mentioned picking up the T4's to Ava she said something like: "You tanned Freak!" Which made me laugh because the T4's are STILL pale. They come with appliers for various bodies, and heads and also for Lumae's ears! So yes, you can use these skins if you're an Elf like The Blogging Elf. I would describe the main difference as the Eirtae's being more romantic and softer and the Ruby being more aristocratic and modern, with cheekbones sharp enough to slice bread! Here we have the Eirtae in T4 with some Pink Fuel Glossy Pout lips and Smokey Boudoir eyeshadow. Gives me a Gogo from Juicybomb meets Megan Fox sort of thing especially with the Catwa head's slightly parted lips option. Hair is Exile Bewitched. Here's the Ruby in T4 with some lippie from the Catwa extras lippie hud. This is about as low femme as I get. Rather Mariska Hargitay (short hair version) here. Rowr. Truth Gaea hair. Here I'm wearing some the Ruby in T4 with eyeshadow and metallic lipstick from Alaska Metropolitan, from the Anybody Event. And here is the one I'm going to use for my profile, a very traditional pale "Celtic Rose CC-ish" look with red lips. And I think I look Kate Winslet's "Rose" from Titanic! Thanks to Ava, I'm the Shopping Queen. This is her Chalkboard set. There are several phrases (coffee, vodka, family, love, etc) , backgrounds, floors, poses you can use. I find it fun and mentioned wanting MOAR phrases. We'll see. Get it at SecondSnaps. And yes, with Shopping Queen I had to pull out a Tiara. Don't look at me that way, I have a Tiara and I know how to use it! Though in all honest I don't really shop all that much compared to most in SL.